Police are continuing to search an area close to where missing student Libby Squire was last seen. The 21-year-old University of Hull student, from High Wycombe, in Buckinghamshire, disappeared on 31 January after a night out. Police have been searching various locations, including the Oak Road Playing Fields, in Hull. 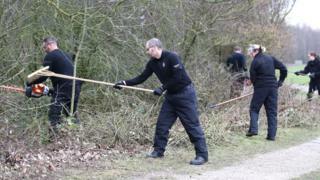 On Tuesday, officers returned to search the area, using power tools to cut back undergrowth. A 24-year-old man arrested on suspicion of abduction remains a person of interest, police said. The force has also written to local residents to ask if anyone heard “anything unusual” on the night of her disappearance. Police have carried out house-to-house inquiries in Hull, and a dog unit, police divers and helicopter have all been used as part of the search effort. The force said it had “received hundreds of calls” and was pursuing a number of lines of inquiry. On the night of her disappearance, detectives think Ms Squire got a taxi at the Welly Club music venue before arriving at her student house at about 23:30 GMT, where her mobile phone was found. They do not believe the University of Hull student entered the house and have said her phone “has not provided any further insight as to her movements that night”. She is believed to have been in the area for about 30 minutes.